☆ 100% WATERPROOF - All Rongee rain boots are 100% Waterproof, which keeps kids' feet completely dry in wet weather. The cotton inner lining is breathable and absorbent, which make children comfortable and happy wearing them in a range of temperatures. We strongly recommend you to use our size guide for better size choice. ☆ HANDMADE and STURDY - Handmade with natural, soft, flexible rubber and anti-slip tread, the vamp and oustole are tested to withstand more than 40,000 times flex without losing function or split. This allows your kids to play, run and jump confidently. 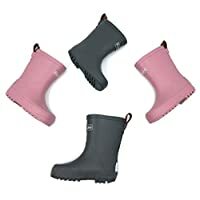 ☆ COMFY - With lightly cushioned insole pads, soft and light-weighted gum rubber outsole, our rubber boots provides fantastic cushion and rebound when your kid is playing crazy. Also, with light reflective heel designed for kids' safety consideration, these boots better protect your kid and encourages them to explore the nature. ☆ EASY-ON PULL LOOPS - Unique LEATHER pull loops make it easy and short work for parents to get boots on toddlers, and help little kids put shoes on and off easier. ☆ CLOTH BAG PACKAGE - Every pair of our rain boots is packed in a re-usable Oxford Cloth Bag, which helps reduce using plastic bags and help to protect the environment.